This guy’s not a creature version of Overrun – we’ll get that out of the way right away. If that’s what you need, Craterhoof Behemoth is still your guy. If you need someone who is good at playing slightly slower, or to interact with cards like Doubling Season or mechanics like proliferate (one of which, I hear, is coming back to Standard soon), go to Venerated Loxodon. Convoking this guy into play as early as turn three is pretty threatening, although it also puts up a big neon sign that says “Do something now or you’ll get a huge attack to the face next turn”. His own lack of combat abilities makes him a less generally useful choice than, say, Lyra Dawnbringer, but there is plenty of room for this kind of effect in all the theme-based decks out there. 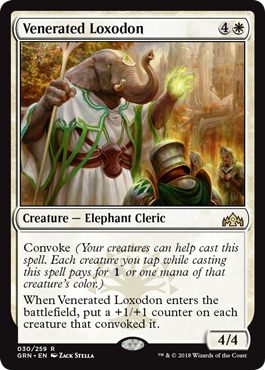 A pretty novel take on convoke, Venerated Loxodon is a creature you don’t want to cast for full price…thanks to that inefficient body. Where it shines is as a zero-mana 4/4 that pumps 5 creatures you control, or even as a smaller pump spell at a discount. This predictably shines in both Boros and Selesnya builds, as they tend to want to go wide with small bodies, and being able to pump things like Mentor creatures can keep the pumping rolling well beyond the initial cast. I don’t think Venerated Loxodon has yet shown up in high-level Constructed, but it’s a card that has some potential as a 1-of in various “go wide” strategies.